Surrounded by a white wall topped with the golden East Asian roofs and interspersed with bright red gates, the Chinese Garden is about as far removed from the traditional Swiss houses neighboring it as possible. The garden is a quiet oasis of little ponds, lush vegetation and intricately decorated buildings with tiered roofs, red pillars and bright green railings, a place where strolls on perfectly planned paths and meditation sessions are possible. Paintings and ornaments feature the unique culture of Yunnan Province and a big focus is set on the three friends of winter: pine, bamboo and plum. The plants are a big theme in Confucianism and since they don’t wither in winter and instead flourish, they represent perseverance. The Chinese Garden was a gift from Zürich’s sister city Kunming, as thanks for the help it received in the construction of a drinking water and drainage system. Now the garden is not only seen as one of the most beautiful Chinese gardens in the world, but is also considered to be the highest ranking temple garden outside of China. Apart from the pavilions and bridges, there is also a Chinese take away next to the main entrance, where one can enjoy the fresh spring rolls with a fitting view. 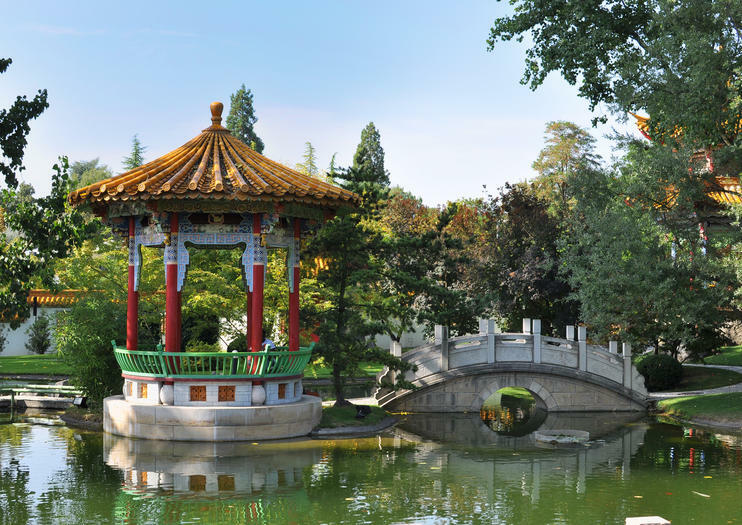 The Chinese Garden can be found between Bellerivestrasse and Blatterwiese on the eastern lakeshore. It is only open in the summer months from the 20th of March until the 20th of October. The opening hours are from 11am to 7pm.